by Nicole Giacomantonio, first year student, MPhil Textile Conservation. Since beginning on the MPhil Textile Conservation course, I have been asked many questions about what I have learned, but none more than “How can I get wine stains out of my couch?” Truthfully, after six months on the course I thought I would have a quick-fix when presented with questions like this. However, I’ve learned that for the treatment of stains, accretions, discolouration, and all other forms of “matter-out-of-place” conservators are often seeking to remove, there is no such thing as a simple answer. 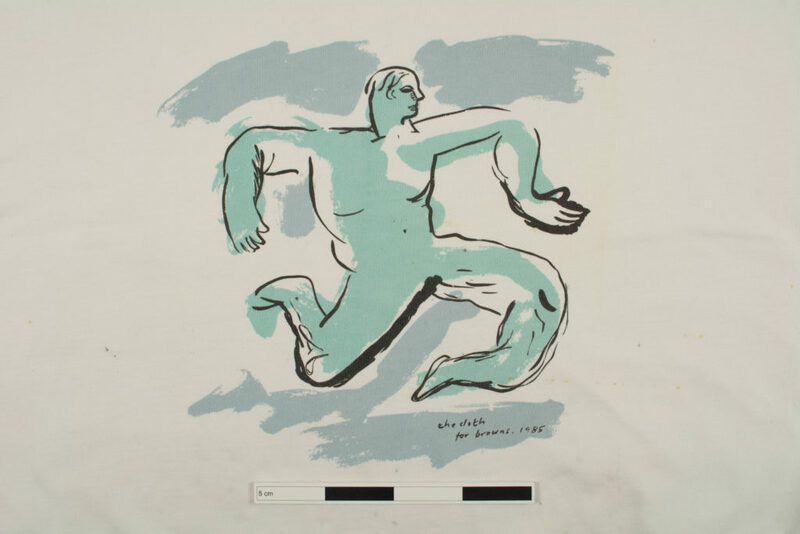 This became vehemently clear during the wet cleaning module of the second semester, when first year students were assigned a t-shirt from the Glasgow School of Art (GSA) Archives and Collections. The shirts were each screen printed with a unique image by design collective The Cloth in the 1980’s. Students of the CTC were asked to conserve them to make them ready for storage and viewing at GSA. T-shirts are familiar items. Most people own a few. The materials are common (most of these shirts were made of 100% cotton and were all printed with commercial screen-printing ink) and the shirts themselves were bought commercially. It was interesting to interact with a familiar object like this – one I own many of – in a conservation setting. When they are dirty, shirts like these are often thrown into the washing machine with the rest of the wash. Two main goals of this project were to visually improve the shirts and to ensure their future stability. The way to achieve both goals was through a wet cleaning treatment. However, for us, the washing machine is not an option. An important step in approaching an object for a wet cleaning treatment is characterization of the soiling present on the object. A lot of information can be gleaned from different types of soiling; stains can be evidential of use, patterns can allude to past storage, and discolouration can reveal the degradation of fibres. Before deciding how to remove it, you must find out if you should remove it. Some stains are significant to an object’s history. 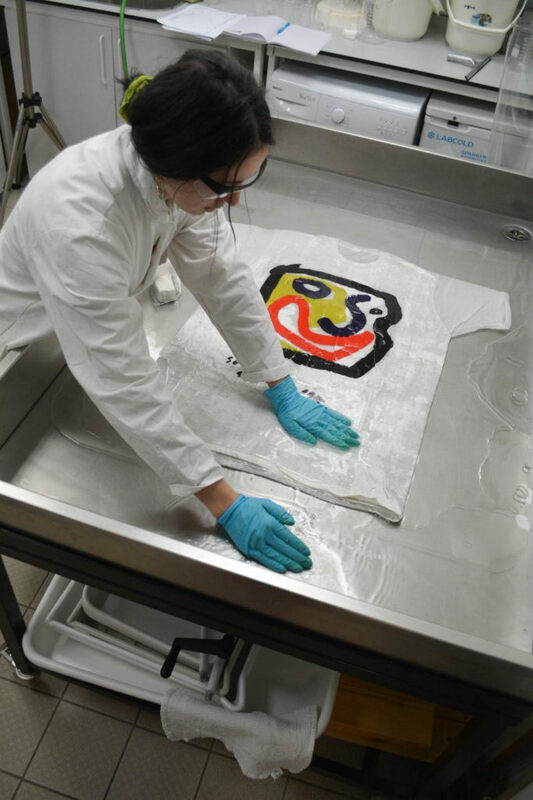 During a visit to the CTC lab, founding member of The Cloth Fraser Taylor recognized one of these ink and paint stained shirts as belonging to The Cloth member David Band, who passed away in 2011. These evidential stains helped to make the shirt recognizable and added to the capacity of the shirt to evoke a memory and emotion. Therefore, the wet cleaning treatment was to be tailored to fit the needs of the object; to ensure that the significant staining remain while effectively cleaning the textile. 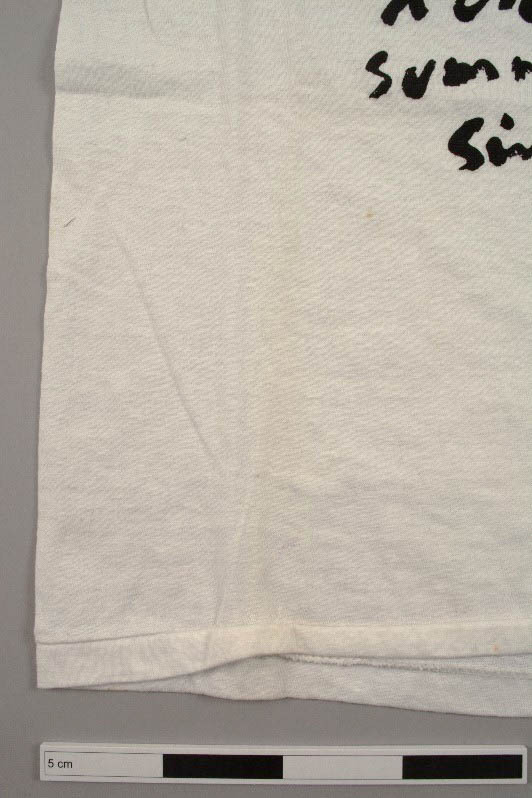 Graphic image of The Cloth for Browns sweatshirt, 1986. (DC 089/3/2/07), after treatment (left) and detail showing the back of the proper left sleeve showing paint splattered on the sweatshirt whilst it was being worn by artist David Band (DC 089/3/2/07), before treatment (right) © University of Glasgow, 2019. 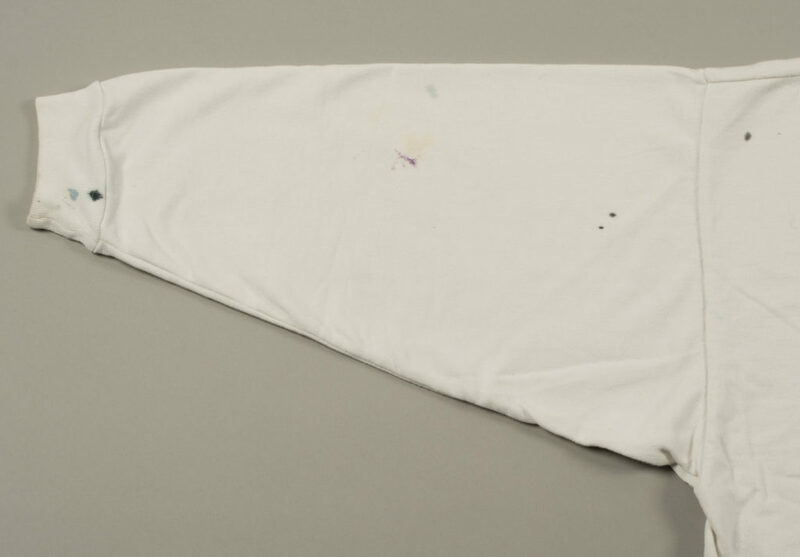 The Cloth for Browns sweatshirt (DC 089/3/2/07), before treatment © University of Glasgow. 2019. The t-shirt assigned to me was designed by The Cloth member Brian Bolger (DC 089/3/2/12). 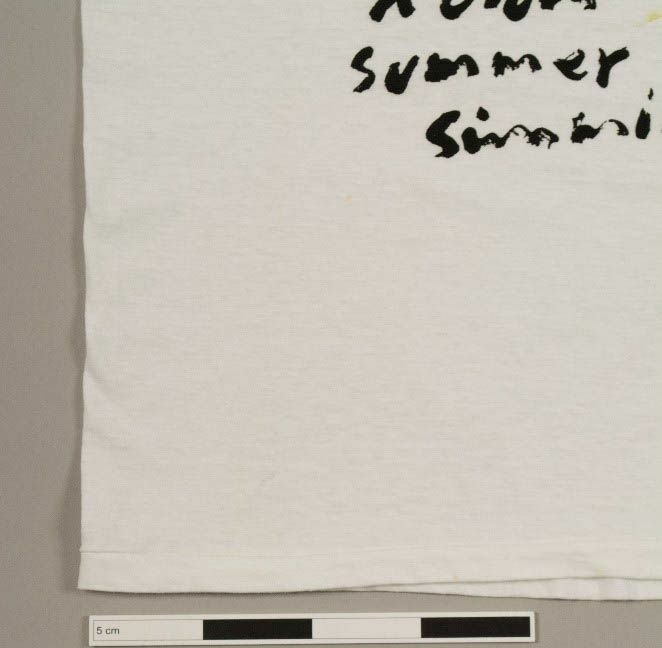 The front graphic had a stylized face printed in four colours with text that read: “A Cloth Summer Summit 1985”. The most significant soiling on this object was cellulose degradation from exposure to light and oxygen that caused an overall yellowing of the cotton fabric. Other stains included isolated areas of mis-placed ink from the screen-printing process, markings on the left sleeve that resembled ball point pen, and the appearance of small, isolated, rust coloured stains. 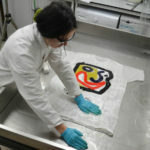 Once the variety of dirt was identified and appropriate detergent was chosen, colourfastness testing on the screen print ink with the intended washing solution to ensure no alterations to the screen printed graphic during the wash bath. Spot testing can be an interventive method but is vital to deciding on the appropriate wet cleaning approach. The ink was expected to be stable, as the garment was printed with the intention of being a functioning shirt. However, testing is always done in an inconspicuous area because… you never know. For this project, wet cleaning served a dual function of removing the yellow, water soluble products of cellulose degradation as well as relaxing creases in the shirt. This process results in loss of the material at a molecular level, but the benefits of removing the acidic, auto-catalytic degradation products greatly outweighed that loss. Mechanical action with a sponge during the two wash baths quickened the treatment and increased the effectiveness of each bath. The action of wet cleaning slightly diminished the pen and ink stains. I did not make any attempt to actively remove them because they were evidential of use. Furthermore, those stains were stable and had no apparent impact on the substrate. Therefore, they would not have long-term implications on the preservation of the object. Comparision images displaying soiling detail before (left) and after (right) the wet cleaning, and the notable removal of accretions along crease lines, removal of the overall yellow discolouration and the removal of significant creasing, DC 089/3/2/12 © University of Glasgow, 2019. Initial wetting-out of the shirt in water without detergent © University of Glasgow, 2019. Wet cleaning a commercial cotton t-shirt involved far more thought than one would expect. Analysis of types of soiling, the substrate material, the unique object biography and the intended future use of the object all effected the decisions made in wet cleaning the object. Taking the necessary time to review and understand the many layers of significance (and dirt) on these objects allowed for successful treatments that have ensured their stability and longevity. Unfortunately, I am still unsure what to say about the wine stains. Buy a new couch?